Why Is Financial Services Hot? What Does Financial Services Pay? Financial services is in constant flux, buffeted by continuous congressional churn, state legislative tweaking, international organization pronouncements, and a virtual tsunami of court/administrative decisions, rules, legal opinions, and enforcement actions by regulatory and administrative agencies. Depending on the definition, the financial services sector constitutes about 20 percent of U.S. Gross Domestic Product (GDP), or one-fifth of the economy. Over time, its percentage share of GDP has steadily increased. 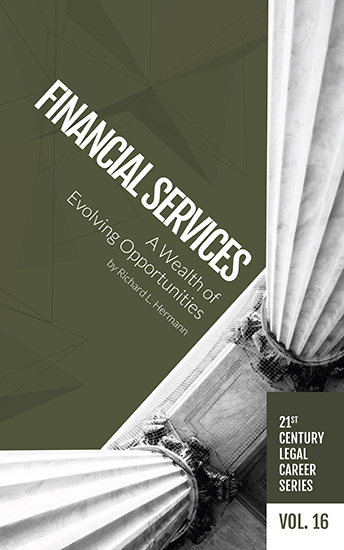 In Volume 16 of the 21st Century Legal Career Series, Hermann lays the groundwork for law students and attorneys to take advantage of the “wealth of evolving opportunities” in this immense industry. Buy the print edition at the NALP bookstore or the electronic version.